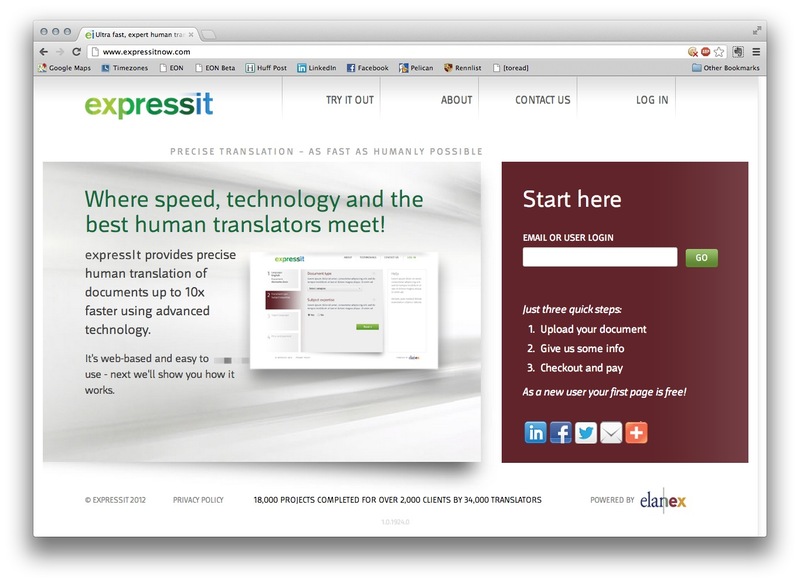 expressIt (www.expressitnow.com) is an expedited document translation service that was developed by Elanex, a San Francisco based professional translation services and technology company. This service enables you to upload documents for translation (plain text, web and Microsoft Office formats are supported), and receive your translated document with its original formatting preserved. This service occupies a space between discount translation services like One Hour Translation and Gengo and full service translation agencies, and is intended as a business support service for companies that need high quality translations for common document formats. The service supports most major languages, and typically offers turnaround times of less than 24 hours. The web ordering and retrieval process is straightforward (you simply log in, select documents to upload, and select your language, then confirm the order). 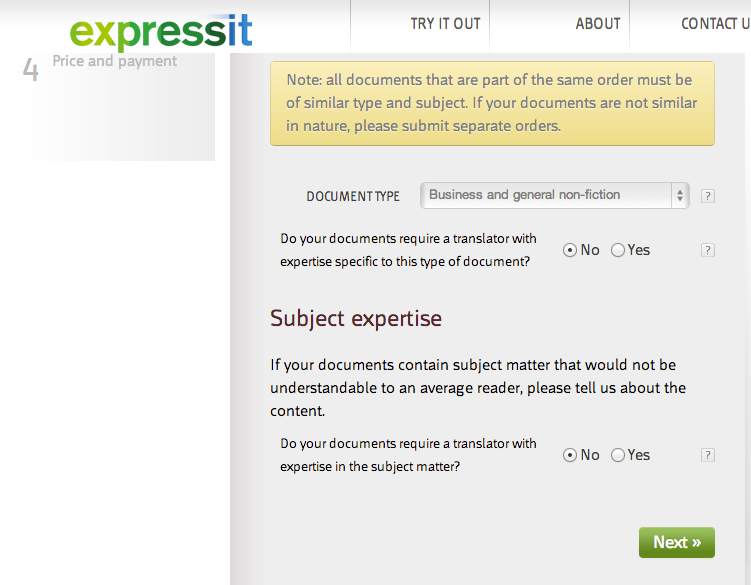 Uploading documents for translation is a straightforward process with ExpressIt’s well designed web interface. The service combines the benefits and convenience of web based translation services with a full service translation agency that has highly experienced translators. expressIt front-ends Elanex’s network of over 30,000 professional translators and takes advantage of their ability to assign jobs not just by language pair, but also by domain of expertise (financial services and legal translation are popular verticals for Elanex). Users can select not only the target languages, but can also describe the general type of translation (legal, technical, etc), as well as specific domain expertise. Tre best available translators for the job are then matched based on these criteria. expressIt pricing varies by language pair, subject and service level, with most tasks priced between 9 and 30 cents per word (specialist translation jobs and rarer languages cost more). The service supports most major office file formats, plain text and HTML. Support for Adobe formats, including PDF, is scheduled for first quarter 2013.
Business users who need to order high quality translations for common document formats with fast turnaround times. Many web translation agencies provide some sort of web order form, but generally work with plain text documents. 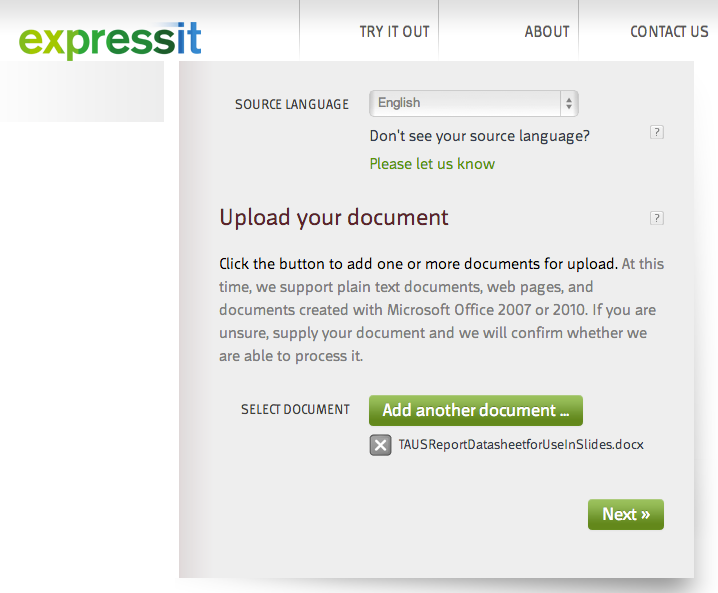 Expressit can deal with formatted documents, and preserves the original layout and visual content of the MS Office files you submit, making it a good fit for business users. Similar services include Gengo, One Hour Translation and Worldlingo, although they tend to focus on more general content translation, and are not set up to do higher end projects, such as legal and technical translation. This entry was posted in document translation, translation agencies, translation marketplaces and tagged document, elanex, expressit, translation. Bookmark the permalink.